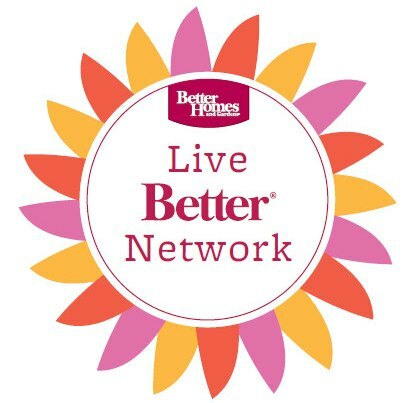 Many of you know that I’m part of the Better Homes and Gardens Live Better Network, and every other month I am challenged to use BHG products in a different way. Well this last month has been pretty busy for us, and the last thing on my mind was blog deadlines. So a few weeks ago (when I was about a week overdue with baby #3) I finally remembered to look up the next challenge theme and deadline. The theme? Bedroom makeover, due in less than a month. Not gonna lie, I kinda had an “oh crap” moment when I read that. That’s a big task for an overdue pregnant lady, and since the guest room and boys room are basically finished (just need to clean them up and take pictures for the reveal post), there was only one bedroom left in our house to makeover…the master. Here is the most recent picture of it, taken on that “oh crap” day about three weeks ago. Yup, that’s an unmade bed with three blankets on it, since Adam and I are both blanket hogs. 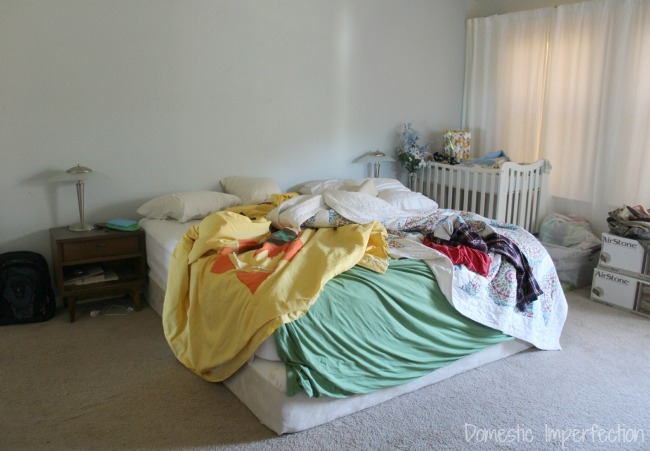 There are project supplies in here, unsorted baby clothes, empty walls, and the shining star of this room…two old mattresses stacked on top of each other to create a bed of reasonable height. And that’s just the stuff you can see in the picture…I’m not even going to get into the mess behind me. In order for this to be a proper bedroom makeover I would need to paint the walls and ceiling, replace the trim, and rip up the nasty old carpet…all things we have already done throughout the rest of the house. But we’re not concentrating on any of that stuff right now, right now we are just concentrating on the fact that finally, after living in this house for SEVEN years, the bedroom looks like somewhere I would want to spend the night. So what did I do? Well, first I actually bought pillows for the shams and put them on the bed. Then I bought a duvet so that we would have more than just an empty duvet cover. Then…then I made the bed. I’ve never been a bed maker (what’s the point, really?) but I just might become one. It’s surprisingly relaxing to walk into a room and have the bed not be a mess. I also painted the nightstands (which you can read about here) and decided to finally replace the office lamps we’ve been using for the last 11 years. …but in the end decided the solid aqua ones. They are probably my least favorite of the three, but looked the best in the room. Here’s my side of the bed, equipped with all the mom essentials you don’t want to be rummaging for at 3 am when the baby is screaming. And lastly, Adam and I made this wooden sign (I’ll post a tutorial for it next week), which I think turned out pretty great. One day (probably right before we sell) this bedroom will get a full-blown floor to ceiling makeover, but for now I’m pretty darn happy with it looking the way it does. It’s a breath of fresh air, especially after being a mismatched disaster for so long. 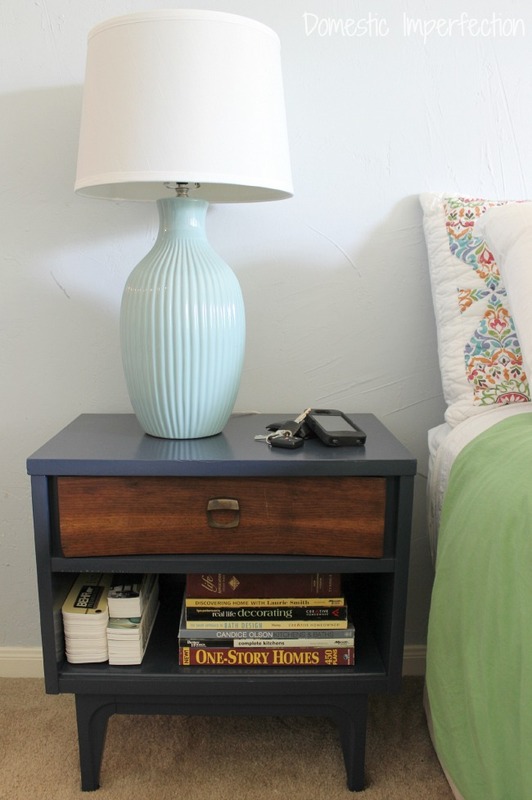 « Nightstand makeover in six easy steps! I’m not a bed maker and my hubs is. I will never get it. Last night I refused to get up so he just had to make the bed with me in it. hehe. Your bedroom looks so calming and comfortable. The sign above your bed is so sweet and the fact that you and your love made it, is very sweet! The lamps really tie in with the color in the sign and the duvet. And I’m with you they would not have been my first pick but they do look good in your room. Hope you are resting in that room when your little ones nap! In the older photos I see you had a bedframe and am curious as to why you don’t use it now. Regardless, the room looks lovely and I especially like the quilt. King sized bed , yes! I would die having to ever share a queen with one or more of my children. 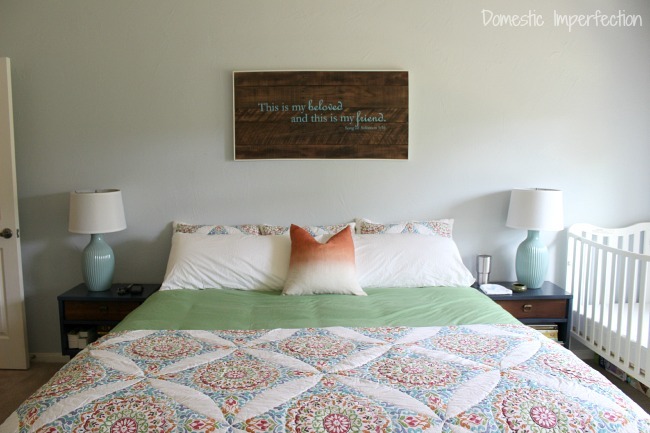 LOVE the nightstands and the quilt/bedspread. Great job! Sometimes simple is better… especially when you’re getting ready to have a baby! I think the room turned out great and I love the sign! Good for you for getting all this done with a new baby and all! The room looks very restful which is something every mom needs. Love the sign you guys made and really like the comforter colors. I’m trying to get our bedroom redecorated too. Bought gorgeous fabric to make a bedspread–now I need the energy–maybe I’m getting old and lazy! ;) BTW, is Adam all healed up now and feeling better? Take care. Yes, Adam is doing great…he is actually out clearing our property as I type. He’s been itching to feel well enough to go destroy some cedar :) Thanks for asking! 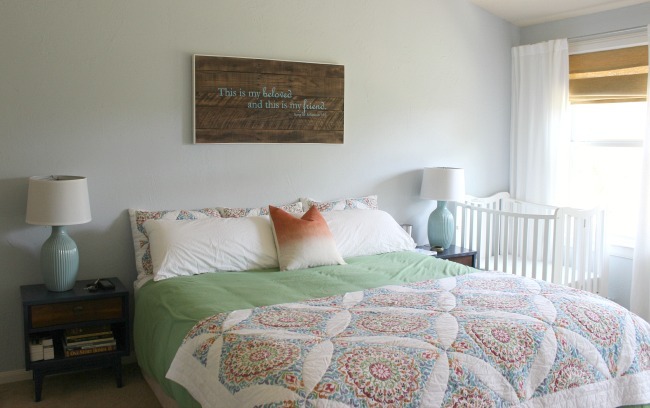 I love the wall hanging and the bedding! The room looks great! Oh my goodness, that’s my kind of makeover. With a 19 month old toddler and expecting a second baby at the end of June, I wouldn’t know how to begin an overhaul makeover!! And I’m with you on making the bed. Doesn’t seem like there is any point, but can make a huge difference! 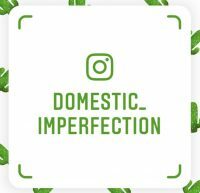 I’m inspired to do a decluttering /make bed makeover in our master! We moved into a patio home in August. Our bedroom is the first thing you see when you enter, and I don’t like to close the door. Therefore, I’ve had to become a bedmaker! It really does make me feel better. Your bedroom looks lovely. I love your room! It looks great. I have been a follower of your blog/site for a while now…. went back and forth thru all your past years to catch up and meet your family! I do have a question about the bedroom (and I agree about walking into a bedroom when the bed is made how it feels more relaxing and to me, even if the rest of the room is a disaster, the bed isn’t). But why not add the headboard and footboards? OK…. I just read the May 2014 post….Wow, can’t believe I missed that one! I agree about the king sized bed. My hubby snores, too, and falls asleep at the drop of a hat! (best time to steal the remote tho and watch any DIY I can find -insert smile here- ). Your master bedroom will end up fab, I’m sure, no matter how you do it or what you decide to make the bed out of. Love your blog and again, welcome to the newest member of your family! I love the transition a few simple changes made! I think those lamps were the best choice also. :-) I desperately need to update our bedroom, too. This post has inspired me that a few simple changes can made a big difference. Thank you! Going through the same thing at our house. I want to switch bedrooms with the den (large) and our bedroom (small) but can’t quite convince my hubby that we should do it. This would help. Thanks! I love what you’ve done. I’m a bed maker. I spent 20 years in the Air Force and got used to it early on. The lamps do look great in your bedroom and I think you did a fantastic job, hon! 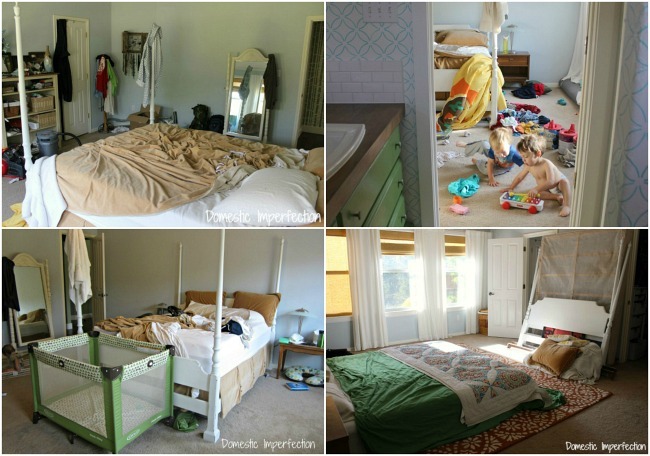 Love the reality pics of your bedroom before the makeover. This reminds me of my house enough that it makes me wonder where did all the junk go? The junk is my house seems to be like an hour glass you push it out of one rm and it ends up in another. All Hail the power of purging…that I never have time to do! Your brdm makeover inspires me to get at it TODAY – thanks! Ha, I was wondering if anyone was going to ask about the junk! A lot of it got organized and a lot went to goodwill…. but you may have noticed that I didn’t show you the other side of the room. Yeah…there is still some work to do. It’s not nearly as bad as it was, but it’s not blog picture worthy yet either. What a beautiful makeover! Good for you to take the time to make your OWN space so lovely and calm and restful. Yes, paint and flooring would be nice, but the results of what you did make a dramatic change. As for bed-making, it can become such a habit that you do it automatically and don’t even think about it. I’ve done it for so long now (never used to!) that I actually dislike how the bed feels when I get in, if it wasn’t made. This from a previously diehard anti-bedmaker! Looks beautiful Ashley! I never used to make my bed either, but at some point I decided it was worth the 3 seconds of magic I get when I crawl into a made bed! Plus the thing you said about walking into a room and the covers not being a mess :) Thank you SO much for not pretending like you live in a museum, and actually showing pictures of real life. Looks like my house! I love it! Is the bed spread new? If so ware did you get it? The makeover really looks great and very peaceful now. I’m looking forward to the post about the sign and especially what you did staining it. Your room looks beautiful! My room also ends up as storage for things. You have motivated to get it cleaned out. 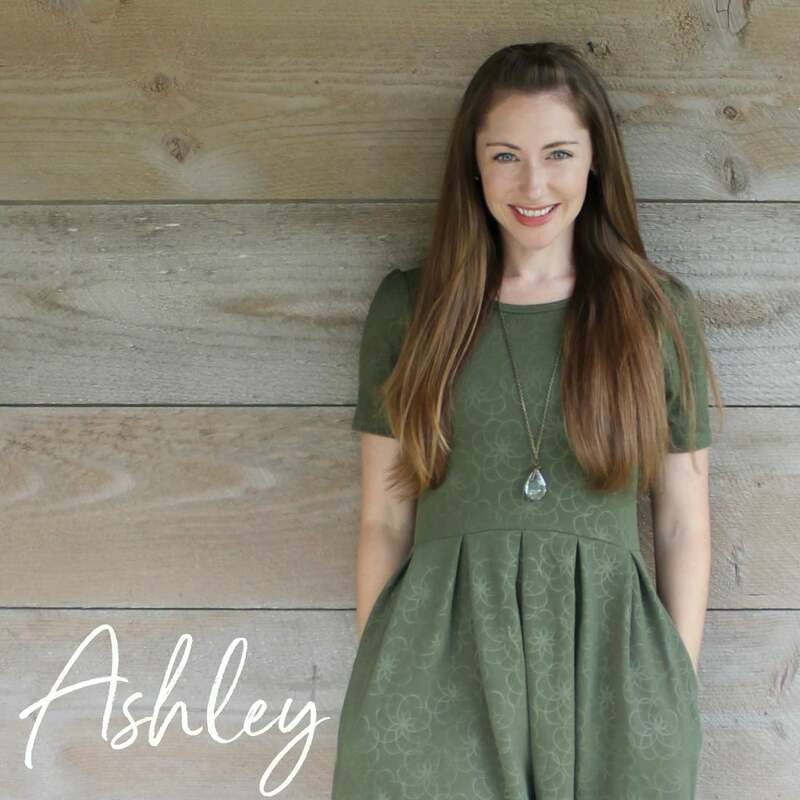 Hi Ashley, I just wanted to let you know that you are one of my nominees for the Very Inspiring Blogger Award that was recently passed on to me! https://fromevijawithlove.wordpress.com/2015/04/12/very-inspiring-blogger-award/ I love your work !! 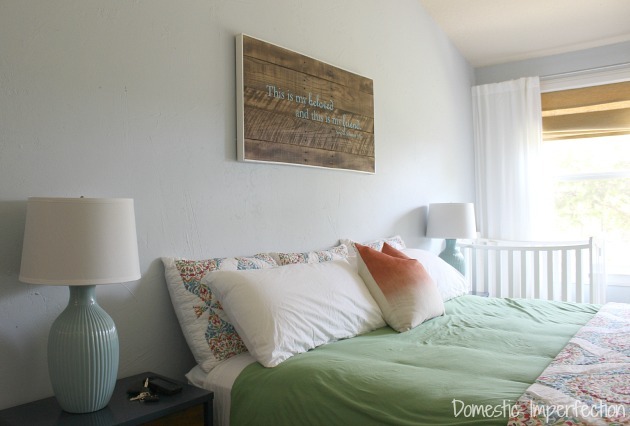 Love the quickie makeover … and actually really like those aqua lamps! OK — if you managed to pull off a quickie makeover with all the recent excitement in your lives, what is stopping me? My master is always the last on the list…. just honestly admitting! I feel challenged now! Great job, Ashley. I love it — simple, clean, peaceful, and calming oasis. 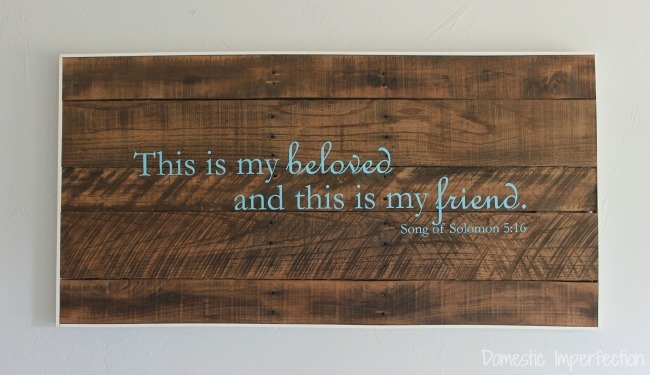 Especially love your wall hanging.. such true words! You should paint a headboard on the wall. This is so inspiring! Our master is tidy and I am a bedmaker but that is about all it has going for it. Our headboard is tufted fabric with rips in it, the walls are nearly bare. I need to get to work just on some decorative touches of stuff I already have! Love the colors, beautiful, Love it! I’d love it if you shared this on Worthwhile Wednesdays. What an amazing before and after! I love the pallet art you put together. It made the room pop! I just found your blog today and have loved going through some of your old posts. I appreciate your honesty ;) Our bedroom is always filled with kids stuff and laundry. You did a great job and your room looks fantastic! 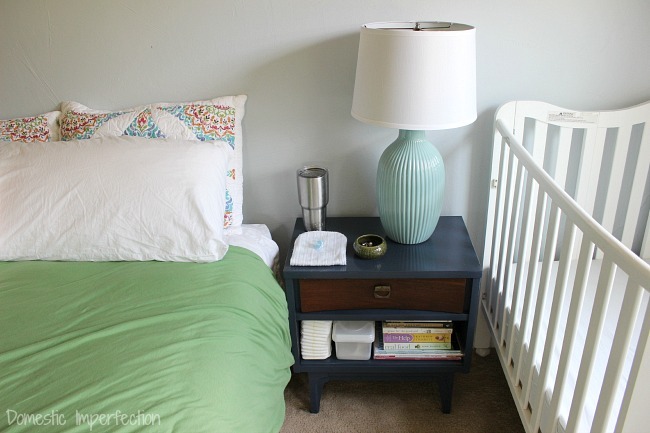 Love the nightstands!